Tubten Pendé, a.k.a. 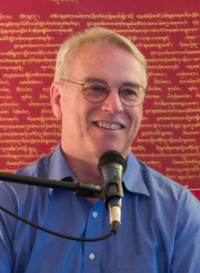 Jim Dougherty, has been a practicing Buddhist since 1972 when he was introduced to Tibetan Buddhism in India. Pendé has studied extensively and was included in the first wave of the FPMT’s Western Buddhist teachers. He is known for his clear presentation and deep understanding of the Dharma, and is interested in the effective application of Buddhist theory and practice in the daily life of ordinary people. The wisdom of ultimate reality is the actual antidote to the addictive emotions that keep us bound to the vicious circle of death and rebirth. It also eliminates the obstacles to knowledge that prevent the direct perception of all aspects of reality. Consequently, the Buddha taught how to cultivate this wisdom and his successors have provided commentaries to illuminate his teachings. His Holiness the Dalai Lama wrote a commentary on ultimate reality entitled The Key to the Middle Way for the sake of helping those who wish to know this profound subject, but do not have the opportunity to study the classic treatises on it. Tubten Pende is providing a commentary to help us understand this important text. The commentary The Key to the Middle Way can be found in the book The Buddhism of Tibet by His Holiness the Dalai Lama.